It’s upsetting when something’s amiss with our child’s behavior, especially when it concerns eating. However, as this family is discovering, acting out of fear at mealtime only makes matters worse. We are writing to you as we find ourselves facing a very frustrating situation. Here it is: We are having trouble during our 20 month old daughter Angie’s mealtimes and that is having a bad effect on me and Catherine. • Take her in our arms round and round the house, show her sights and smells and somehow shove food into her mouth. We are at the end of our rope and, as usual, are turning to you. Please help!!! First, thank you for trusting me with your plea for help. As loving as I know your intentions are, my plea to you is to stop this strategy of diversion with your daughter. Your worry and frustration about her not eating is understandable, but in order to resolve the issue – believe it or not – I recommend doing something totally counterintuitive… trust her. Trust her to eat what her tummy needs when her tummy needs it, and don’t offer her one bite more than she requests. Children typically go through appetite phases, and just like adults, sometimes they’re not hungry. Children are not naturally inclined to starve themselves, so assuming you’ve checked with your doctor for any medical reasons for your daughter’s loss of appetite, it is likely the result of these normal fluctuations. Problems arise when meals become power struggles instead of relaxing and enjoyable times to focus on food and each other. 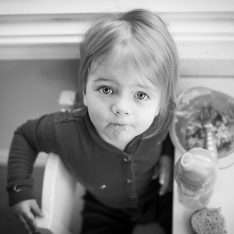 Struggles at mealtime can actually cause the very problem we are hoping to resolve – a child who won’t eat. Healthy eating is about listening to our body’s signals. When we stop trusting our child to know her body and start trying to “get her to eat”, we risk disrupting her ability to read signals regarding hunger and fullness, which can potentially affect healthy eating in the near and distant future. Even subtle coaxing and encouragements (like congratulations for a clean plate) can thwart healthy eating, because mealtimes become about pleasing or displeasing parents rather than listening to one’s tummy and enjoying food. How does a child feel when she has food shoved into her mouth while she’s distracted? I know you don’t intend it as such, but this is a kind of assault. Certainly, she feels disrespected and manipulated, which then makes her feel distrust. Fooling children into compliance is a quick fix that can have long term consequences. As benign as it may seem, I even object to “dream feeding” (breastfeeding or bottle feeding an asleep baby) which some experts advise for helping babies sleep longer through the night. I understand parents’ desperation for a few more hours of sleep, but I worry about doing things to a baby without her awareness. Would you want to be fed or have your nails or hair cut while you’re asleep? Babies need us to be open, honest and authentic, not sneaky and tricky. In relationships, honesty is everything. Distracting a child not only undermines trust, it trains our child to be inattentive and unaware. Do we really want our children to get into the habit of disengagement? Will encouraging a child to be out-to-lunch at lunchtime affect her general ability to focus and concentrate? These sensitive early years have a profound effect on brain development, and we can’t be too careful. Toddlers are perceptive. When they feel manipulated they react with more resistance, which breeds more manipulation. This pits parent against child, when what we really desire is a close, trusting connection and partnership. Parents know best, much of the time. But our baby is the one and only expert on the inner workings of her body and mind. Only your daughter knows (and will ever know) when she is hungry, what she would choose to eat, and how much she needs. So be clear about the behavior you expect when she eats (i.e., require that she sits and doesn’t throw food), present a couple of healthy food choices and then let go and let Angie be totally in charge of her tummy, even if it means she skips a meal or two. Stop working at it, and I guarantee she’ll stop refusing to eat. Isn’t it a relief to know that you can trust her? P.S. I’ve written much more on this subject (with many more specific suggestions) in Elevating Child Care: A Guide to Respectful Parenting and also Dodging A Toddler Food Fight and Mindful Mouthfuls. This is a great article! May I print it for my classroom? Last year I had a parent who really wanted me to push her (2yo)daughter to eat at lunch time and I felt very uncomfortable – caught between my responsibility to the child and the school’s policy of making parents happy if it’s “just a little thing”… having literature like this available would really help avoid situations like that in the future! Thanks, Megan. 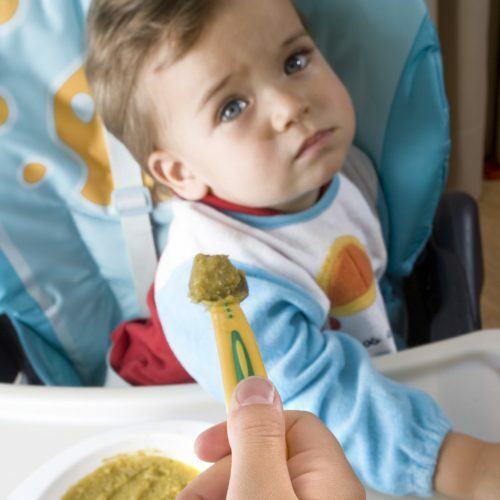 Yes, eating can be a sensitive issue for parents and definitely for toddlers. Please share it! Trust your daughter! An almost identical situation happened to me with my son (now 23 months old) when he was 20 months, like your daughter. Always a wonderful eater and lover of all my homecooked foods, he suddenly didn’t want to eat anything (or very very little) even his favorite dish. This was extremely disconcerting to me, and I had sworn off long ago any tactics of distraction or manipulation due to the fact that my mother used many of those ways with me and as a result I adopted a very skewed relationship with food that took most of the early part of my adult life un-doing. And while I had sworn I would never coerce my child to do this, there I was seriously considering it. …and then… I didn’t. I trusted him, even those nights when he didn’t eat anything and I thought I’d be up at night hearing him cry for food or that he’d wake up earlier in the morning completely ravenous. Neither of those things happened and within two months he was back eating all of his favorites and being more adventurous with new foods too. I joked with a friend the other day when I said, “children aren’t inherently suicidal’, and by this I mean they are incredibly connected with their bodies and their needs and in any normal situation, they won’t starve themselves or deprive themselves of basic needs. Trust her, and I hope you are as surprised as I was! Thanks for bringing this discussion to light, Janet. Hi and thanks, Valia! Wow…I really have to disagree strongly with your doctor on this one. Beginning the habit of TV at mealtime and at 11 months old? I am stunned that a doctor would recommend that. Children need “face time” when they eat, not screen time! And can’t we trust a child to know what she needs? She may be a brilliant doctor, but I don’t believe she respects or understands babies. Hear hear, Janet. We put doctors on a pedestal, but sometimes they really don’t get it. A friend of mine many years ago had a colicky baby and was becoming depressed and tearful- the doctor told her to go home and have a whiskey. That led to a lifelong dysfunctional relationship with alcohol which pretty much destroyed her life. Doctors are people too and make mistakes. Trust your instincts. Would you apply these same guidelines for the child just learning how to eat? 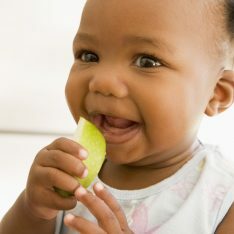 For example, our 8-month old is just learning to eat solids – open her mouth and manipulate the food to swallow. She seems to do the same things, like refusing to open her mouth. However when she actually tastes some of the food, like on her lip or sticking just her tongue out (yes, it’s pretty funny) she likes it, but I sense she isn’t quite getting how this eating business works; like opening her mouth to get more. Same plan for the “just learning” crowd? **An aside to the others, I get how food can be such an issue too! It’s hard for me not to push because I see it as my “ticket to freedom” from the breast pump at work so I really want baby to eat more solid food. Beth, thanks for the great question (and I love the aside!). Yes, I think infants deserve the same patience and respect, don’t you? I remember introducing solids being a much slower, more gradual process (with at least one of kids) than I had expected. And it makes sense… The baby’s thinking, “Why put this stuff in my mouth?” It’s as if I gave you a piece of paper to put in your mouth that was actually food. It tasted okay, but totally different from anything you’d ever had before. That would be a little difficult to get used to, don’t you think? And then if I was pushy about it… Hmmm… I bet you wouldn’t like that. You’d be much more likely to try some if you trusted me because you knew I trusted you. Thanks Janet!! I completely agree, I think infants deserve the same respect. It’s a mantra I’ve learned from you and keep repeating when interacting with my daughter. I’m constantly amazed by the level of ignorance and bad advice and bad practice out there when it comes to food- thank you for countering it. I loved the article, brought me to tears. I really struggle with emotional eating. I related so much with what you describe. It is now my priority to make sure I don’t pass on those ideas to my baby (and yes, try to heal myself). Thank you for your post. Shared already! Thanks for the mindful advice as ever. We are following it for a week… and guess what, the whole household is so much more peaceful, and Angie is just lapping it all up. Janet, I discovered yous website yesterday in search for some advice on my parenting. I have a wonderful 2 1/2 year old girl that I feed by letting her watch cartoons on my computer and shoving food into her mouth. I have been doing this for over a year and it’s the only way I can get her to sit and eat, otherwise she’ll run about the house with me after her trying to trick her another bit of food in her mouth. She is not fat nor thin, she’s a healthy baby. The problem is that I would really like to break this bad habit and not have her associate cartoons with food, and I’d also like to minimize TV/cartoons time. This eating routine is also a problem when we go visit other families that have toddlers: the other kids usually sit in their seats and eat (with parent’s help of course), but mine would refuse to sit and she would go play and run and I would feed her in the meantime. I’d really appreciate if you could give me some practical advice on how I can teach my daughter to enjoy meals for what they are. Looking forward to your answer and thank you for your wonderful blog! Hi Adela! You can help your daughter break this habit, which I agree is not healthy for her. The important thing to realize is that you have created the habit and are continuing to reinforce it by coaxing her, running after her with food, etc. Once you stop doing that, your daughter will be able to settle down, eat autonomously as she should and “enjoy meals for what they are”. We fall into habits like this when we worry and/or falsely believe that it is up to us to “get” a child to eat. Children can be trusted to eat when hungry. Make it clear to your daughter that you expect her to sit while she eats and that she should get up as soon as she is finished. Even if she gets up after just one bite, put the food away. If she tries to leave the table holding food, hold her hand and the food before she gets a chance, and say, “You can go, but the food stays here.” Don’t scold or get angry. Be clear, relaxed and matter-of-fact. You make the rules; your daughter is in charge of her tummy. She is very capable of doing this. Anything other than trusting your daughter to eat what she wants/needs is unhelpful. Our agendas complicate what could and should be a very simple issue. Thank you again for your reassurance Janet. It is always comforting to hear that our situation is not unique. For the best part of 6 months, our son hasn’t eaten dinner. At first we worried, then we thought he was eating too much in the afternoons, but when we looked at his diet there was nothing to suggest he was over snacking. Then we accepted that this is what his body tells him. He will eat some pickings but essentially he eats nothing at dinner time. After looking at his eating habits though (he eats an enormous breakfast and morning tea/lunch but is just not hungry after nap-time) we decided that if he were hungry he would eat. We also think it is important to have positive eating habits and a positive attitude towards food. The only way this can happen is if we continue to offer him healthy food and respecting that he know when he is hungry and when he isn’t. I just wanted to share a book that goes along the same lines as this article “How to Get Your Kid to Eat, But Not Too Much” by Ellyn Satter. It goes from birth into adulthood, and the point is you choose the foods you serve and when, your child chooses what and how much to eat. I first read it for my university feeding young children class and re-read it when my child was learning to eat. I have followed it’s principles and now have a 2 year old who is a very healthy eater – without any “work” on my part. I know a child’s personality will play a role in how well they eat, but with your and this book’s strategies, all children will eat what they need without the parent’s need to worry. I have a question about this; what if the child is 5? He often turns his nose up at dinner…Okay, always! He never eats more that three coerced bites. We did try this “Let them eat when they want to” Method when he was little, because someone gave me this same advice. But now he’s a growing boy and started kindergarten and needs both ample sleep and ample nutrition. Is he too old to get away with turning down healthy foods in favor of the bread or fruits? (Which we always try to use as the encouragement for eating the proteins and vegetables.) Help? Most nutritional experts advise against using food as a “reward” for eating other kinds of food. The problem is that the “other” foods become even less desirable than they would be, because the child realizes that he or she is being bribed to eat them… I’m obviously not a doctor, but I would let this go. I would let my child live on bread and fruit for a while. Fruit contains some protein, did you know that? Supporting the child’s capacity to self regulate is most desireable. Most of us have been bullied and manipulated around food when we were little and our own issues make it challenging when our children exhibit strong preferences. Fasting is most theraputic and used to be a regular part of good health management. Animals ( and we are animals) rarely have a constant supply of food. Many health problems are from over eating. 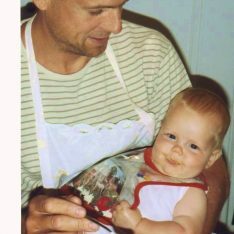 I had a very hard time getting my son to eat food, any food, after he stopped nursing at 21 months and I started giving him cow’s milk. It was all he would ask for, morning, noon, and night. I finally took him off dairy entirely and I can’t believe the difference! He eats. Everything! He has a wonderful appetite, and now I can actually trust his body. He was also very constipated and strained and went for many days with no bowel movement. Now he poops easily and with no pain. Make sure there is not a food allergy issue as well. My 27 month old son does not have a problem with eating, in fact he eats plenty of plain bread, rice or pasta. How do I get him to eat / try other things? Also in regards to parties / outings, what happens when your child is too excited and completely does not eat? Is that normal? Yes, it’s normal not to eat when excited, distracted or overstimulated, so I would maybe offer your child a meal before the party. It’s also common for children to go through phases when they only want one or two types of food. Offer a variety of foods (with a light, light touch) and then accept your child’s choices. He’ll branch out in time. We are really struggling with our 16 month old. We were following this approach of laid back baby-led-weaning, and letting him tell us when he was done eating. But then over time we noticed that he was eating less and less, and soon he started to get very thin to the point that neighbors and even close friends were pulling me aside to make sure I realized he was too thin. I want to trust that he knows how much to eat, but is there ever a case where a toddler really doesn’t eat as much as he needs, and loses weight because he won’t eat? My husband wants to force the issue, and make him eat by sitting with him for hours if needs be, bite by bite, until he finishes his plate. I think this does more harm than good, but don’t have any other ideas since we have already tried letting him self regulate, and that ended up with an unhealthy toddler. My 15-month old daughter has a similar issue – refusing to eat or even taste food on some evenings during dinner time. She eats really well at day-care, so I think part of the problem is psychological – maybe she knows we might offer her alternatives if she doesn’t eat what is put in front of her first. We are trying not to cook ‘special foods’ for her anymore now that she has several teeth, and simply have her eat what we are eating for dinner especially since she has now been introduced to all types of foods. The part I am having a hard time with is sticking to this rule and accepting letting dinner end without her eating much of what we are eating – especially knowing that if I presented her with some healthy options she does like (there are a few fail-safe staples like yogurt, sweet potato, steamed carrots), she would eat them. Is it OK to let her ‘go hungry’ if she doesn’t eat what is there for dinner that day? I don’t believe it is a lack of appetite since she would eat other options if presented, but I also don’t want to get in the habit of what I feel is rewarding her lack of eating by giving her those alternatives, even they are healthy ones. Any advice? Thanks for your article Janet. This is exactly what Ellyn Satter (dietitian and child feeding guru) recommends- trusting your child and allowing them to regulate the ‘whether’ (whether they eat) and the ‘how much’, while the parent decides the ‘what’, ‘when’ and ‘where’ of eating. I’m also a dietitian working in this area and I have to constantly remind my clients to sit back, hand over the control and trust their child when it comes to eating. It’s not always easy but it’s all about long-term thinking vs. short-term gain. Do we make him to stay in his highchair until we are done or are we doing the right thing by taking him out when he signs done? Any tips for getting him to stop throwing food off his highchair? Should we sit him in his highchair for 3 meals a day or is it OK to let him graze while he plays/wonders around the house? We would love your help! Thank you. Can I suggest sitting him at a kiddy sized table & chair to eat, and letting him come and go as he pleases. Just until he’s old enough to sit still for a bit longer. Some toddlers just don’t seem to have it in them to be confined for long enough to eat a meal, which I don’t think is a bad thing…. kids are designed to be on the move after all! If you don’t want food over the house you could try telling him that when he’s ready to eat, he needs to stay at the table. Even if he only comes back for one mouthful at a time. He will grow out of this stage eventually 🙂 This may not work for you, but it’s all about trial and error with these things! Another thing to keep in mind, kids like to have something to rest their feet on when sitting (have you ever, as an adult, tried sitting with your feet dangling for long periods… it’s uncomfortable!) There are high chairs available that can be adjusted through their growing years so they always have a foot rest. I love this article! I have been guilty of coercing many different children into eating over the years (I’m a nanny), just to make sure they’re getting “enough” food to thrive. But I’m a big believer that people have lost the ability to listen to our bodies, and part of this starts with learning to eat when we’re not hungry. I have come to realise more and more that when toddlers are hungry they will eat, and I try to work with that once I get to know their routine. ie I will offer healthy snacks at whatever time they ask for food, or I will keep their lunch until they are ready to eat it, rather than forcing it at prescribed times. I have often thought, when someone says their child eats like a horse at breakfast but not for the rest of the day…. why not try giving them their main meal first thing (ie meat and veg, like we have for dinner)?! Who says we have to have cereal for breakfast! I regularly find myself telling parents that it’s common for toddlers to barely eat for up to 6 months (as long as they’ve been checked medically of course! ), and I really don’t know how they still have so much energy, but I’ve never seen one fade away yet! They are usually eating at some point in the day if you look closely though. The only problem I have noticed with this method is when parents freak out about the child not eating and offer them less healthy food “just so they’re eating something.” To me this is just another way of distracting them, and they end up eating because they’re offered unnaturally yummy food (have you ever polished off a whole pizza even though you knew you were stuffed already! I know I have!). This also makes it harder to steer them back towards good food as they get older. What do you think? As always, your blog posts seem to have perfect timing for our family. My husband and I just had a conversation about our 2.5 yr old not eating dinner lately. He really wanted to “make” our LO eat, but I agree with trusting our little guy. I know that the more we try to push it, the more he will *passionately* resist – it’s nice to have this confirmed in your post. We decided, however, that it’s important for us as a family to set a standard for being present at mealtime, sitting at the dinner table and asking permission to leave. For him, we only request 5 minutes (during which he may or may not eat a little, and we talk about our day) and a “may I please leave the table?” He is very happy to do that. Then he goes to play while we eat, and he is learning that we will not come play too since it’s dinnertime and we are still eating. Hi Janet, I’m going through the same thing with my 27 month old son and he won’t eat anything like meats, beans and lentils all those good nutrients that toddlers need. He does eat yogurts, cheese, eggs, fruits and of course he drinks his milk. But I still worry. His Dr. says he’s fine. His weight is 25 lbs. Any suggestions.. my husband say’s I worry to much!! It’s just because he’s so tiny and skinny. My son is 20 months old now and is extremely difficult to be fed. As a result I make him sit on his high chair, give him iPad to watch rhymes and give him some toy to keep his hands busy while i push the spoon in his mouth standing behind him. Yes, he wouldn’t put food in his mouth if I try to feed him sitting in front of him. So i stand behind his high chair and push the food in his mouth at a moment when he is completely unaware of. It started at around 10 months when he was being fed by nanny. In order to ensure that he eats, she started this habit which has continued until now from the last 10 months. If i don’t feed him this way he won’t eat any thing at all. Only some days he will have few spoons normally i.e me sitting in front of him and he will open his mouth to eat. But that is like once in a while. I want to come of this way of feeding him as it is becoming increasingly difficult and meal times are becoming stressful for both me and him. Please advise me how to stop this and make meal times fun for him. I am having the same difficulty feeding my son. Please let me know how you managed this. Any advise will be appreciated. I am still working on this. My son is 21 months old and his main source of nutrition is breastmilk. He nurses a lot during the night and refuses all food during the day. I cook for him every day, 4 meals, all different and organic and they all end up in the trash. I don’t know what else to do, how much more I need to trust that “he knows better”??? He never ever had any fruit, he gags just to look at it. He will only eat capers and olives…extremely acidic stuff. He refuses the food, but I know he is hungry because his belly makes noises and then goes to the refrig and points desperately to the capers (he could have a whole jar of them). Doctors keep on dismissing me saying that he will eventually eat, but how long is too long to wait???. I appreciate this advice but I haven’t seen anything about a baby who may have a growth disorder and is failing to thrive. My daughter is 15 months old and weighs 16lbs 6 oz :/. Should I treat things differently with her or do the same everybody else has been advised? I’m jealous of all these folks concerned about their children only eating 1 meal a day. My daughter took in about 19 oz in the past 3 days. She doesn’t seem sick or like she has a sore throat. We are currently waiting for an appointment with an endocrinologist on October 26th. Heather – in answer to your question: “Should I treat things differently with her or do the same everybody else has been advised?” I would say that it’s even more vital for you to trust your child and not create any tension around mealtime. I have worked with families with severely underweight children and, to my surprise, the children ate very well at snacktime with me in my Parent-Child classes. I strongly believe that is because they felt no pressure. Thanks, that’s what I’m working on doing. I just do dishes and focus on her older sister at meal time uness she express escan interest n eatng. Eating is a teeny bit better but hydration is still very concerning. I’ll be calling her doctr when they open. My 20 mon the old usually cries to tell me when she wants to eat, she refuses to talk, but today she has not cried for lunch at all. Should I offer lunch or just let her tell me when she’s ready to eat. I am really trying hard to get her to talk. She can say some things but only when she wants to. Help!! Am I doing wrong by not offering her food when she hasnt showed any signs to eat? Hi Janet! I wonder if you could give me any advice about our son’s problem. He is 19 months old and still doesn’t chew his food. I still have to cut everything into tiny bits and pieces. Plus he refuses to eat fresh fruits and vegetables. Fruits go well when I mash them and hide inside a yogurt or porridge. Then he loves them. But as a piece he treats everything as a biological weapon. All this despite the fact that I started with home-made food as most of moms etc. I’m seriously fed up with this issue and have to admit that I’ve also raised my voice at meal times but of course it doesn’t help. I would get over my tiredness over his eating issues if I didn’t have to put him in day care soon. All other kids there eat as normal and nobody has time to make purees for him alone.I don’t want him to start hating this place due to food or starving himself all day long. That all sounds great and makes a lot of sense but I have a toddler who often will only eat when distracted. He is 3.5. Ever since he was about 1.5, he has been a very picky eater. We did the thing where you just keep offering him healthy foods. Despite that, his food choices have only narrowed – he’s at the point where he will only willingly eat a handful of foods. I have also done the thing where you don’t give him other options besides what is healthy. He has gone a full 24 hours without eating and gotten so famished he just falls asleep. So, we are at the point where we distract him and don’t show him exactly what we are feeding him. He is 3 and has some understanding of what he is eating, of course, but we will sneak vegetables and proteins in if we can get away with it. I know this is deceptive, but left to his own devices he would literally starve himself before eating a vegetable. Conventional wisdom says kids will not starve themselves but I promise you my child absolutely will. If anyone else has a child like this or any advice for me, I’m desperate for some direction. hi there, i have a question. My daughter (3) is in my friends daycare so this is quite a sensitive matter. My daughter does not want to go to school anymore because she sais that she does not want to eat lunch there. when i asked her why she said they hold her nose when she has to swollow the food. She also said they feed her huge bites of food on the spoon and that its to big so the gags, then when she gags they hold her nose. She has become quite a picky eater and they are very strict at school (my friends daycare) about all the kids having to finish all their food. I understand that there needs to be rules at schools and all of that but i mentioned to my friend that she does not like it and now my friend is feeling offended and also asked my daughter why she goes to mommy for everything. My daughter came to me and said that i must not tell the teachers that she told me cause she will get in trouble. So….for me, if a 3 year old thinks in this direction (of not telling the teachers she told me) im not wrong for feeling concerned, right? or am i being over TLC? Please help as i want to be there for my child. Heidi, that is not okay at all! And the fact that she asked your daughter why she goes to mommy for everything? Well, that’s emotional manipulation. Your friend is being abisive towards your child, and possibly others. I would get your daughter out of the environment and report this to someone who will do an investigation. That may sounds harsh, but this type of behavior is harmful to children. It is harmful to people in general. If it would be abusive when done to you, then it’s abusive when done to children. So I have a 2.5 yr old who I pretty much have to force to eat most days, I dont like it but otherwise he wont eat & will wake all night hungry. What do you recommend in these situations??? I have a very opposite problem..my son is 22 months old and is always hungry. He is tall for his age group and very active. He is hungry from the moment he opens his eyes..the first thing he wants is a bottle..usually warm water or redbush tea followed swiftly by anything that comes to mind at the hour of 5 am..usually apple or banana..then oats and asks for seconds often thirds..I then pack oats or jogurt and another fruit for school breakfast at around 8am…lunch can be meat and sweatpototo with broccoli and baby marrow or such and then he is crazy hungry when he gets home and just wants MOREMOREMORE..dinner i similar to lunch..
the problem is the portions..he stuffs himself till his tumm is hard.eating same amount as grown up person..and gets hyped and panicky in his constant need and demand for food..otherwise a busy but calm and sweet natured child food brings out the crazy in him as if he is starving or will be denied food..he sits prospectively with his arm around his bowl of food..head tilted to one side and gulps it all down in one go.. I have tried reassuring him that there will always be enough and he has never wanted for anything..was baby led breastfed till well over a year.. I have done the deworming but it didn’t make a difference..
he has now developed some food intolerance and im worried that this is adding more of a spotlight on the whole debate..
people are constantly commenting on how much he eats..I really want to understand this better so that I can help him to enjoy a healthy relationship with food.. I just want to add that I have tried getting him to put his hands down between bites , saying ‘relax’..and this does sometimes work but not really..
we do not eat together as dad is more inton eating snax by himself and i hardly get a chance to sit with him cause im always running to cater to this eating need..even if I try to prepare up ahead.. I wonder if I didnt make to big a deal of enjoying food when I introduced him to solids and now he is trying to please? Mabe I fed him too fast when he was still spoon fed..
Hi Janet, thanks for this. How would you deal with your toddler (in my case 10 month old pre-toddler) refusing to eat anymore of one food but downing another food you offer directly afterwards? For example veges vs yoghurt. Should the meal just stop when they’re ‘done’ with the first food? I would offer a selection of the foods that you are okay with your child eating and then let go of the results. I have been following your facebook page for quite a while but havent been able to put into effect some/most of the things I read as I have a toddler who is on the autistic spectrum of disorders. She is 33 months old and on the moderate to mild side of the spectrum. I wondered how much of your techniques/recommendations are applicable for children on the spectrum. I think my daughter was not born very competant, she spends very less time in self exploration and when she does if she fails- she gets extremly frustrated and turns destructive. She is underweight and I have a hard time trusting her natural insticts to self feed.. I have been following your Facebook posts for a while now and I have questions regarding feeding my toddler. I have a unique situation. When she was 1 1/2 years old, she went through a phase of not eating much for a couple weeks, which I just shrugged off as either teething, a possible viral illness (she was running a slight temp), or just being a toddler. After about two weeks of this, one day she had two seizures. Two ambulance rides and a three day stay in a pediatric hospital later, she was diagnosed with ketotic hypoglycemia, exacerbated by accelerated starvation. Sounds scary, but basically her body isn’t able to use energy stores effectively just yet, so overnight (or any extended period of time not eating) her blood sugar drops low and needs to be brought up significantly in the morning. Now I feel like I absolutely have to stuff her full of food at each meal, the threat of her having another seizure is terrifying. I know I need to follow doctor’s orders on this, which are to keep her fed, especially first thing in the morning. But there are times she doesn’t want to finish her meal or even half of it and I end up doing anything to make that happen. Which I know could be setting her up for issues in the years to come. (She should outgrow her condition, usually by 8-9 years old.) Do you have any advice for me? I am sorry, Teila. That sounds very stressful situation for your family. Obviously, you must follow your doctors orders. What I would suggest working on is monitoring your own stress levels, particularly when she is eating. Our stress, anxiety, or sense of urgency, etc., have a negative effect on our children’s appetite. So, I would do your best to stay calm and trust her as much as possible. Take care. My situation with my 20 month old son is different. Since a few days he keeps on asking me non-stop for food in a way that it seems like he is super hungry. He even cries or screams if I don’t respond right away. And then … no matter what I give him he eats only 2-3 bites and leaves it. Within half hour is the same thing – asks for food and does not eat it. I have offered all his favourite food, have even changed the menu every time he asked for food but it is not working. It is frustrating because I don’t know anymore what to cook and he is eating very little. He still breastfeeds, so after he leaves the food for which he puts a fight to have it right away, he ends up breastfeeding. Any advice? You are doing a great job, may god bless you and all your upcoming generations for such a work. am one of the millions of parents who look up to your site for solutions. I m confused a bit and looking for your assistance. My daughter is 23 months and started solids when she was 6 months. so far she has had about about 2 months of considerably good mealtimes on total. which means she hasnt been a good eater so long. she has weight issues and doctors have even checked for allergies and ruled-out that option too… just last month suddenly she ate good meals for a week or soo. then again she stopped eating. we eat as a family, we dont have screen time and we dont distract her . she self feeds and rarely we feed her. How should i proceed with her, how do i encourage her to eat? is she manipulating or testing our limits? its very frustrating for us adults. Today is 01/19/18 and my daughter is 21 momths old. This is exactly what is happening to my daughter right now. Since she was 6 months old up until now she was a very easy eater. I’m asian and i cook asian food. She did eat. I thought she might be tired of the same food she ate. I offer her new food and avocado which she ate, she wouldn’t eat. I kind of did what the parent above did. I distracted her, i force her. Wouldn’t work. I have to give up but it’s making me crazy. I came across this article and it kind of make me feel better. My daughter only drink some milk, eat a little of gold fish, she eats a 5.3 oz of yogurt. In my mind i keep afraid she doesn’t get enough to live that’s why it makes my go crazy. So should i let her choose the way she wants? What can i do? Will she be better ? Sure? Helpless and restless. We are in a very similar situation with my 20 month old daughter. She has been an incredibly picky eater since 12 months and the last month or so she throws tantrums during a lot of mealtimes. Lately whenever I offer her a meal, she will not eat it and just keeps asking for cheese. All she wants to eat is cheese. I started giving her cheese in the beginning because I was hoping it would pass but it’s now been a month and I’m getting discouraged and frustrated. Tonight I offered her dinner and she had two bites and asked for cheese. We told her that it’s time to eat dinner right now and not cheese and that is all that’s available. She threw a huge tantrum and threw food on the floor and became upset. We continued to tell her that that was all that was available and we felt horrible about it but the issue is that this has happened many many times and she has gone to bed without dinner often and still seems to be interested in a power struggle. Is she asking for cheese because she wants to see that if she asks for something she can get it. As in she can choose what she wants to eat or not. Any other tips. She used to be in 80% for her weight and then she dropped to 40% and now she’s in the 20% I’m obviously getting very concerned but if she were to eat snacks or anything she actually really likes she will eat them so I know she is just picking and choosing. My 2 year old son was eating jelly sandwiches cheese puffs of that nature and then when he got Hand Foot and Mouth he stopped and hasn’t wanted to eat table food since. He is still eating baby food. He cries and covers his mouth when I offer him food we eat. HELP! !